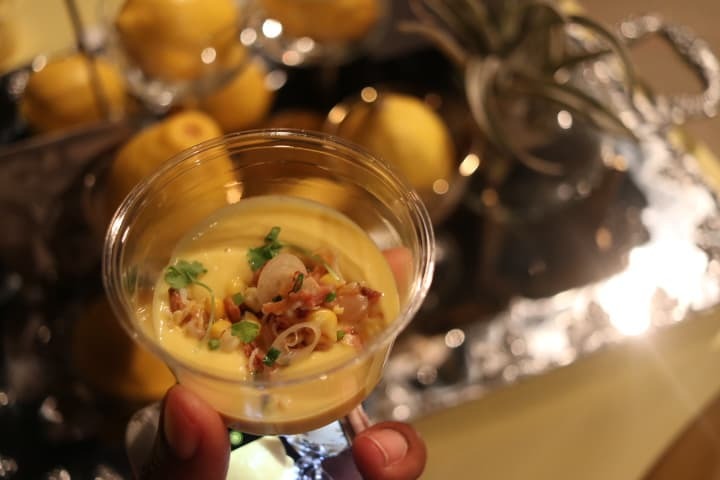 More than thirty of the country’s finest chefs gathered for The Great Chef’s Event at Revel Fulton Market in Chicago’s West Loop neighborhood to showcase their culinary creativity in the name of charity. The result was an evening full of exceptional bites and most importantly monies for Alex’s Lemonade Stand Foundation! This was the first I’d heard of Alex’s Lemonade Stand Foundation and I was deeply moved by Alex’s story. Alex’s Lemonade Stand Foundation or (ALSF) is a national childhood cancer foundation dedicated to raising funds for research of new treatments and cures for children battling cancer. They also provide emotional, financial, and logistical support for the families of these children. Services such as these are a source of refreshment for families during extremely worrisome times. I’ve seen firsthand the relief that provisions from such charities bring to families in need. Founder, Alexandra “Alex” Scott was diagnosed with neuroblastoma, a type of childhood cancer, shortly before her first birthday. It was doubtful that she’d ever walk again even if she beat her cancer, but she proved to be a determined and courageous child who was an inspiration to others. By her second birthday she was crawling, able to stand with leg braces, and working towards gaining the strength to walk. Unfortunately, within the next year, her tumors were growing again. During a hospital stay shortly after her fourth birthday Alex told her mom that she wanted to start a lemonade stand once she got of the hospital so that she could raise money to help other children going through the same thing. Her first stand raised over $2,000. Alex and her family continued to hold yearly lemonade stands and by the time she passed away at the age of 8, Alex, with the help of others raised over $1,000,000 to aid in the fight for curing childhood cancer. Her family and supporters around the world continue her legacy through Alex’s Lemonade Stand Foundation. Over 700 guests attended the hugely successful event hosted by Chef Paul Kahan, Restauranteur Donnie Madia Gianfrancisco, and Chef Tony Mantuano. You can also spread the word about this important cause.